Many anchor companies size their anchors based on winds up to 30 knots, in stable seabeds, and in protection from open waters. Then they will state that for stronger winds, less stable seabeds, or subject to more open waters, increase the anchor size by one or even two sizes. Of course a larger anchor is more expensive. A Super MAX Anchor is sized for your vessel and there is no need to upsize to a bigger anchor for more challenging conditions. Our anchors are designed to hold in hurricane force winds, in a wide range of seabeds, and where there is minimal protection from open seas. We hope you never have to go through a hurricane (isn’t it comforting to know you can) but a sudden squall with extremely strong winds can appear quickly creating the need to take shelter immediately. It is comforting to know that your Super MAX anchor deploys and sets quickly and holds your vessel in a variety of seabeds. The Super MAX pivoting arm anchor is designed to be quickly adjusted when seabed substrates are different from what you expected. The one bolt adjustment provides simplicity to change from sand, to mud, to ooze setting. No need to retrieve the anchor, remove it from the bow roller, disassemble the anchor on the deck, and reassemble the anchor for redeployment. Simply retrieve your Super MAX anchor, allow it to rest in the bow roller, and with a proper size wrench, move the pivoting arm bolt to the proper setting. Deploy the Super MAX anchor and you are back in business. 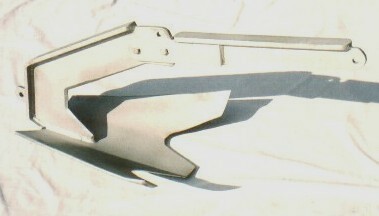 Most anchors have one universal setting (angle) to deploy in all seabeds. A few anchors have a two setting adjustment but disassembly of the anchor is required. The Super MAX pivoting arm anchor is the only anchor in the industry that offers three settings to maximize the hold in varying seabeds. with a simple one bolt adjustment. The design of the Super MAX anchor makes it the perfect anchor for a variety of seabeds employing a simple adjustment. It is the only and last anchor you need (unless you change boats).